"We would suggest - tentatively - that it would be worth considering that feathers originated much earlier than we thought," Prof Mike Benton, from the University of Bristol, told BBC News. Hailing from China, the 160-million-year-old fossils are of two different pterosaurs, one of which is newly discovered. In depth analysis shows that as well as fur - which has been suggested before - the flying reptiles had feathers like some dinosaurs, including the theropods. "If I just saw these fluffy bits on their own, I would swear they were from a theropod dinosaur," said Dr Steve Brusatte of the University of Edinburgh, who was not part of the study. "This means feathers were not a bird innovation, not even a dinosaur innovation, but evolved first in a much more distant ancestor. "The age of dinosaurs was full of all sorts of strange feathery creatures!" Image caption Are these feathers? 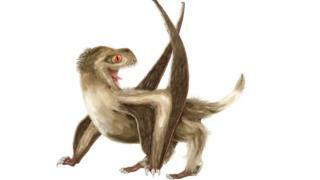 The researchers found that the pterosaurs had four different kinds of covering, including fuzzy, fur over most of their body; and, on parts of the head and wings, three types of fibres similar to modern feathers. The fluff and feathers are likely to have been important in heat regulation and aerodynamics. "These structures on the pterosaur make it look a bit like a fruit bat, or something like that, a fuzzy hairy creature," said Prof Benton, who worked on the discovery with colleagues in China. "They fly with great out-stretched bony wings that carry a substantial membrane, a bit like a bat." Questions still remain over whether these are true feathers. If they are, it would suggest that feathers appeared millions of years earlier than previously thought. Alternatively, feathers could have evolved twice during the course of evolution. Insects were the first group to achieve the ability to fly: they developed wings at least 320 million years ago. Pterosaurs were the first vertebrates - animals with a backbone - to evolve powered flight, about 230 million years ago.